READY FOR LOVE: Reality Show Attempts to Match Life Partners! 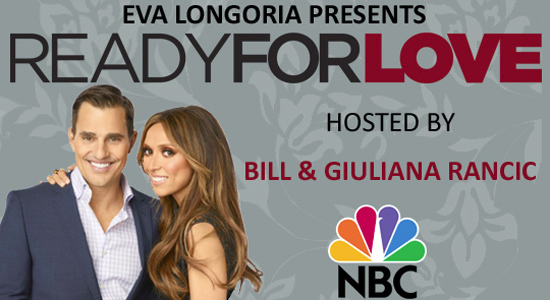 Eva Longoria presents Ready for Love. Television 2012, Reality Show, coming soon from NBC. Hosts: Guilianna Rancic and Bill Rancic. HOLLYWOOD JUNKET’s EXCLUSIVE! On Set News Report! Have you ever met a man in his thirties that was well established, kind and good looking yet still single? If you have you might have wondered what could possibly be wrong beneath the “perfect” surface. NBC’s upcoming dating show, “Ready For Love” will take three successful men, Tim a musician who is in pop rock band “The Plain White T’s”, Ernesto a philanthropist, and Ben a financier on a journey to find their one true love. The show has an interesting lay out, three matchmakers searched across the country for four women for each of the contestants. Each of the match makers has a different approach to love and dating, the first woman owns a successful dating company and is considered to be one of the top match makers in the world. She frequently works with celebrities and athletes. She is currently happily married with children; she said she is living the perfect life, you know the one with the perfect husband, children and the cliché white picket fence. The second is a single guy that believes he is good at his job because of his long running career as a match maker. He believes the fact that he is still single allows him to stay current in the dating scene therefore he is always well informed on new ways to find people love. The third matchmaker was a woman who was married three times and writes for The Huffington Post. She believes she has an advantage over the other matchmakers because she knows how to get the guy, get him to commit and is familiar with mistakes people often make while they are married, which She believes leads them to divorce. In the first episode, the three men will be introduced to twelve women because each judge will have picked four women, they feel are compatible. By the end of the episode, each contestant will have nine remaining women that will go on to round two. The show contains one simple twist; when the contestants first speak to the four women there are standing behind a wall therefore they cannot see what they look like. The women will then introduce themselves along with answering a few questions; their answers will determine whether or not they will stay or go home. Some viewers will find a couple of the scenes intriguing because one of the women that was there for Ben was a former girl friend. Another woman that was there for Tim, was a former fling. This twist may give people an initiative to watch a couple of the episodes however it will be difficult for them to stay interested. The pilot is incredibly cheesy. The hosts are Guilianna Rancic and Bill Rancic, television personalities on E! Both claimed that finding each other was the best thing that could have happened; they gushed about how happy they are. As stated earlier, one of the match makers explained she is living the perfect life; this is unrealistic. Let’s face it shows like “Leave It To Beaver” and “The Brady Bunch” created an illusion of what the “perfect” relationship truly is. This dating show seems to be following in their footsteps. No couple will ever experience love without bumps in the road and most of all that white picket fence is often symbolic of phoniness. It was revealed on the show that one of these dater contestants is still a virgin and waiting for marriage. Each of the bachelor’s were given four potential matches from each of the match makers. They would arrive on elevator’s; the girl that was not chosen would meet the bachelor afterwards, hug him and than the elevator would go down. The next group of girls would arrive by the elevators. Once the girls were selected they would walk over and stay at different windows. There was a large wall on the right side of the set with three different sections; one for each of the match makers. There were twenty four windows, each of which had a girl by the end of the episode. Each week one of the girls will be sent home; by the finale each of the men should be engaged, married or in a relationship if all goes according to the plan. The only thing this show has going for it is having Eva Longoria’s name attached to it; she is the executive producer and is currently a popular name in the industry. Each of the contestants will have their own personal story in a video that will air during the first episode. All of the videos look like bad infomercials; they are boring, cheesy and over the top. The show’s fate is in America’s hands, it will debut this upcoming winter!